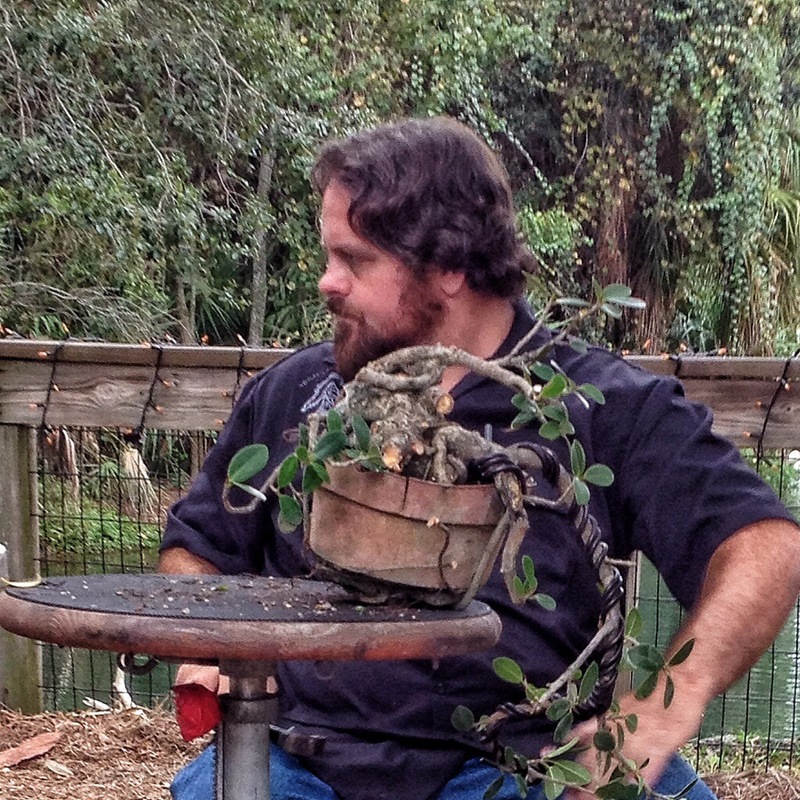 Here at the nursery we offer repotting, styling, and general maintenance of clients bonsai. Supplies and a per hour fee ($45) apply. I will also visit your home for the same offerings for your collection. I do have many specimen trees available for demonstrations should you require one as well as workshop quantity and quality trees. 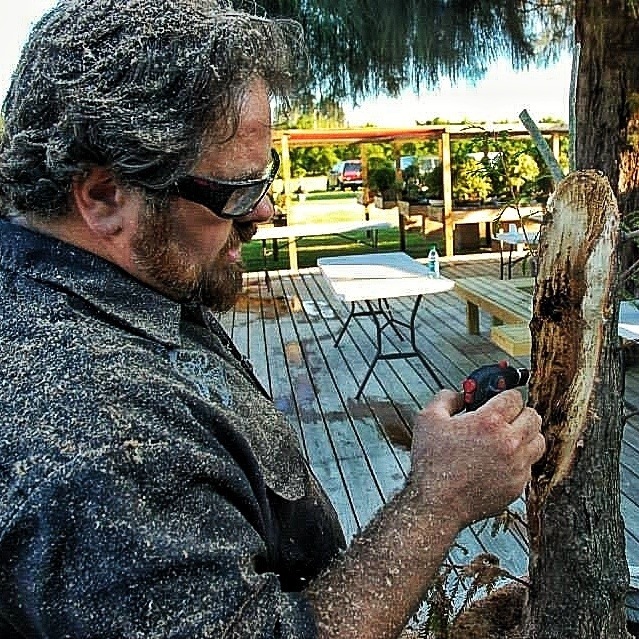 My main specialties are shohin/chuhin size trees as well deadwood carving. I am familiar with temperate as well as most tropical (duh…Florida!) trees and my teaching and styling rely heavily on sound horticultural practices. Email (adamaskwhy@yahoo.com) or give me a call (407)399-1224 to check for availability. 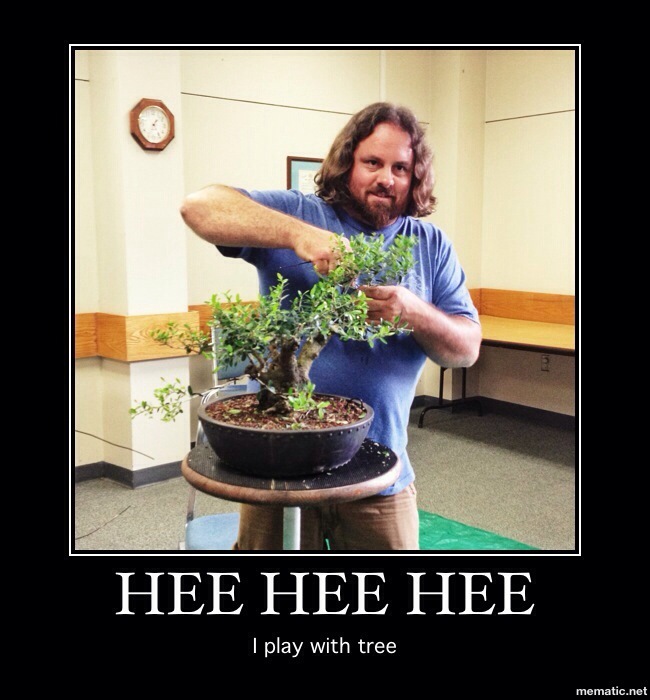 I’m not your average bonsai demonstrator. The jokes are often and exceedingly bad. 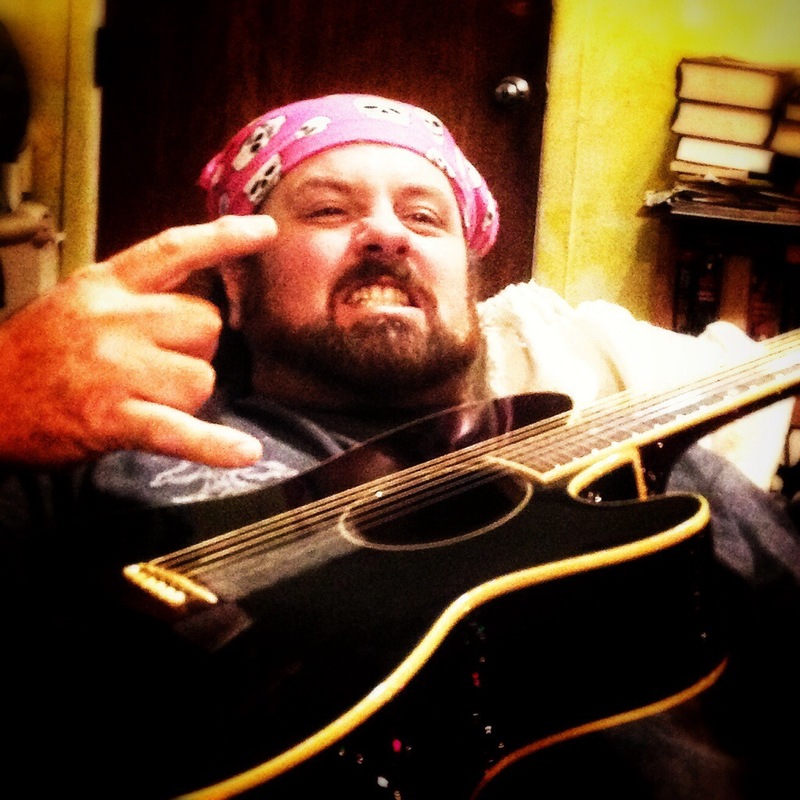 I can provide for a slight musical interlude during snack time…..Rock On my friends, see you around! A question from the north…from someone who is not even a beginner. I had a Punica granatum germinated from a seed this spring. That in Québec City,Canada. This means zone C3b or 4a. As fall rolls in, the leaves begin to turn yellow and look like they are going to fall. Since it is a deciduous tree, it is not surprising. But what next? How do I keep it alive, leafless, during our long winter? Should I let it sleep for a month and then increase the hours of artificial “sunlight” to get the leaves growing again? I would let it stay dormant at least until the end of February. A deciduous tree that’s not allowed to rest will slowly die. I know this because I can’t grow Japanese maples in Orlando for that reason. <The front as of now <The back <Le top <Pretty roots/trunkThere you have it and all its glory 🙂 the green around the base is stain from the dyed moss it came with Has had no pruning of any kind in the past year and flowered last in spring. Thank you so much for getting back to me so fast, it means a lot to me. I generally can't even get people that work with bonsai to reply for some reason. I know this is off the subject, I have two ficus that are in trouble. one is a green island and the other a tiger bark. They are very nice trees and I am going on my third winter with them. last two winters they did fine in the house and out side in the summer. Last year and the year before I would check the pot for dryness with my fingers and ended up watering about once a week. I have use the same approach this winter but every time I water the tree looses about a fourth of its leaves. I am loosing branch after branch and afraid of loosing both trees. Should I repot or what. Please email me your thoughts. The question is, have you never repotted? With ficus in bonsai pots you should be repotting every year. But dont repot now in winter, you do it in the late spring/ early summer. The best you can do is to give them more light and warmth, watch the dryness and hope for the best. Anyway, I’ve had the tree for a little over a year, and it’s been growing just fine. It’s a little lanky, but it’s in its early stages. The tree started putting out flowers a few days ago, and then all the leaves just up and dried. Nothing has changed. The watering has stayed consistent, the temps have been in the mid-high 50’s at night and low-mid 80’s during the day for the last month or so. Nothing drastic has happened, yet the little bugger’s leaves all turned crunchy and dropped. Unfortunately, I keep reading conflicting information on the species. Some sites mention that it’s mostly an indoor tree that loves moisture, while others mention that the tree loves dry, hot weather. I apologize for the wall of text, but any help would be appreciated. PS – Your posts on dwarf jades have really helped me out. My wife got me a cork bark dwarf a few years ago. I unfortunately killed it, but not before getting a handful of cuttings. I have a dozen jades at this point that I absolutely love! In my research it says that the tree is native to the Mediterranean, where it is hot, dry, and very sunny. I would not take the advice of the sites that say it is an indoor tree. Anything that lives near the equator needs bright sunlight to thrive. As an aside, every tree does better outside. The sites I visited say it doesn’t have to be an arid plant, so, if it’s in coarse bonsai soil, you can keep it uniformly moist. As far as the leaves falling off, I don’t know. Watch the moisture, until the leaves come back. Wish I had more info for you. Thank you very much for your reply. I’ve moved it onto a porch where it will get morning sun, and I’ll watch the moisture. Thing is there’s hot dry and sunny, then there’s Yuma. The soil is about 20% organic, which helps hold moisture when it hits the 115’s in the summer. The lava rock and gravel were sifted to about 5mm-6mm, but I’ll make sure it’s not getting too much water right now. Here’s hoping it makes it! Hey Adam, I was wading through some of your older posts and came across a mention of and Adam Art and Bonsai t-shirt. Do you have any for sale? Hi Adam I love your blog and am always looking for new insights. I had a quick question for you, I’m looking to do some grafting on a black olive for the first time. I want to use a branch thats already from the tree and move it. I know there is thread grafting but can i just cut the branch off drill a hole and take off the outer layer so that the cambrian on the branch and drilled hole touch? I’m not sure really how to go about doing this! Thanks for your help and greetings from Miami! You could try that. It’s a little more iffy than a thread graft or approach graft where the scion still has its own roots to keep it alive. What you are describing is being called a peg graft. It’s a modified form of cleft or wedge grafting. Look up the different techniques that have been used. Grafting is one of the oldest forms of horticultural techniques around. Hey man. My name is Rich. I spoke with you the other day about collecting spruce pine. I finally got in touch with Jason schley. He confirmed that what it was. Anywho. I was wondering. Do you sell pumice? Or know where I can source It? I really would like to follow your soil ingredients. Do you sell and ship shohin sized specimen? I recently found your blog and then youtube channel and I love your work. I would love to have a gnarly little tree that you shaped yourself. I ask if you can ship if I can pay whatever the cost, because I know I could never pick it up by hand due to distance. It’s okay if you don’t. Thanks! I don’t like to sell and ship through pictures, they never look like you thought they do. Jefferson County in the eastern panhandle of West Virginia.That’s okay if you don’t do shipping. I can just enjoy your work with my eyes. Adam……….Any chance you coming to south africa? Hi Adam, I gave found your blog few years ago when I just got my first dwarf jade. The blog was the only sensible piece of information on how to maintain the tree well. So my tree got quite nice since then, even though I was not giving it the best care, but today I have made a mistake. I have repotted it from a large pot with regular soil to a smaller and nicer pot with very coarse soil for succulents. Looks good, but I habe watered it. Not sure why, probably because I forgot about it while repotting other plants. Here is my question – would it make sense to repot it tomorrow morning again into a dry soil, or everything is ruined already and I just need to sit and wait for the treeto die?